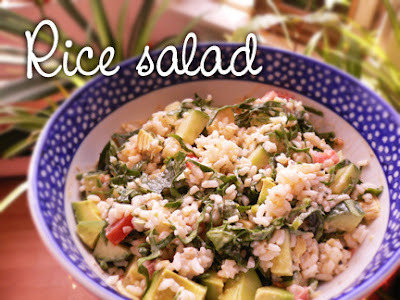 Place the rice in a large bowl and fluff it up with a spoon, fork or your hands to separate the grains. Add all the remaining ingredients and fold in gently and thoroughly to evenly distribute all the vegetables and seasonings. Serve chilled or at room temperature. Serves 2 (as a main dish) to 4 (as a side dish). For a pretty presentation, spoon onto bowls lined with boston lettuce leaves.